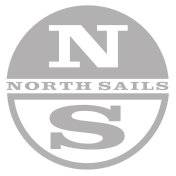 North Sails all purpose mainsail for the Front Runner. North Sails jib for the Front Runner. North Sails asymmetric spinnaker for the Front Runner. Manufactured out of .75 oz. Nylon.